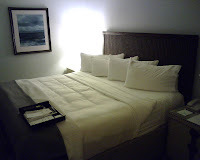 I recently stayed at the Loews Coronado Resort on business for three nights. I found this hotel very comfortable. The hotel grounds and common areas are very well maintained. The facilities are nice, I enjoyed the pool area and fitness area and found both very functional. They might not be as nice as some places I have been but worked well for me. I was with a group, otherwise there is a $10 charge for the fitness area and frankly if I paid I would have been a little disappointed as it needs some updating and more equipment, but for free it was just fine. The pool area is very comfortable with nice loungers. The bar by the pool isnt open during weekdays which is a bit of a drag as you have to walk inside for refreshments but otherwise I enjoyed it. The hotel has one restaurant and it is nice although I wouldnt want to eat there for more then 2 nights, it could get old quick. There is beach access from the hotel via a tunnel and the beach is very nice as well. The room is very comfortable, clean and well maintained. 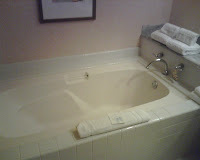 The bathroom is large with a soaking tub and separate shower. The bed was wonderful!! and I always enjoy hotels where all rooms have balconies. There were plenty of amenities in the room including one of the best coffee makers I have seen in a hotel (Krups Cup) with a full supply of coffee and tea which is unusual, most hotels just give you 2 of each and they gave you 4 regular and 2 decaf. 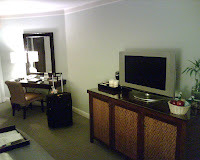 The room had a plasma HDTV which is nice and robes with slippers are in the room. The only downside was the front desk which is the weakest link at this hotel. The front desk staff are pretty uninterested in you and just going through the numbers but after you get past them you will be very pleased. The upside is that every other staff member I met was fantastic. They all cheerfully greet you and are very nice and housekeeping is fantastic with twice daily service. I would easily stay at this hotel next time I am in the area. Overall a terrific visit.